When your goal is maintaining good oral health, having healthy teeth is only half of the equation. The other half is healthy gums. Many people rarely think about the health of their gums… until they develop periodontal (gum) disease. This condition is much more common than you may think: In fact, about half the population over 30 years of age have some degree of gum disease. And periodontal disease — not tooth decay — is the largest cause of tooth loss in adults. If you’ve been diagnosed with gum disease, periodontal therapy will probably be recommended. In general, periodontal treatment can range from in-office cleaning to minor surgery, and includes at-home care with careful monitoring. Treatment recommendations will be based on your individual circumstances. Periodontal disease is a bacterial infection that may occur when harmful microorganisms start multiplying in your mouth. These bacteria thrive in plaque, a sticky film that coats the surfaces of your teeth. When plaque isn’t removed effectively (by brushing, flossing, and professional cleanings), it builds up, causing irritation and swelling in the gums. Bleeding gums is an early symptom of gum disease. 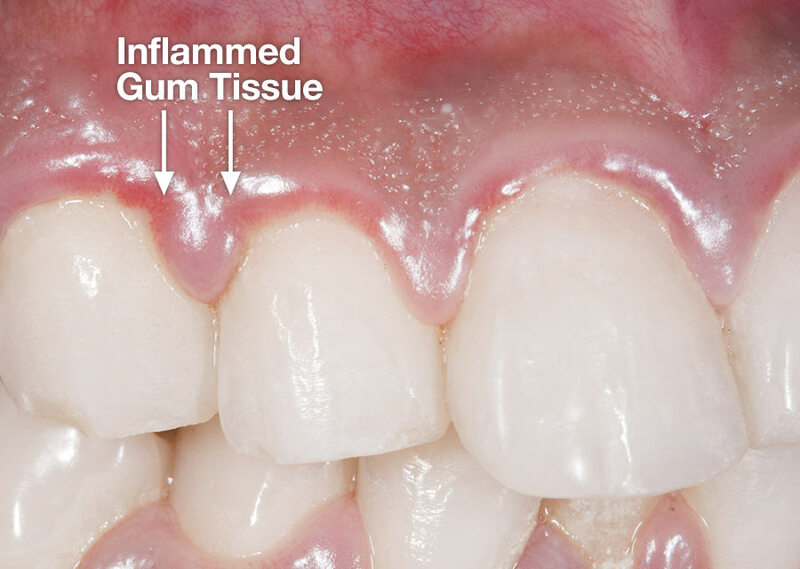 As the disease progresses, the inflamed gums begin to pull away from the teeth as bone is lost. Small pockets can form between teeth and gums, offering a favorable environment for even more bacteria to grow. The mounting infection can spread through the gums to the tooth’s root, the jaw bone, and beyond. Left untreated, systemic (whole-body) infection and tooth loss may result. If periodontal disease is found early enough, it’s often possible to treat it without surgery. A procedure called scaling and root planing is often recommended. In this treatment, dental instruments (both manual and ultrasonic) are used to remove sticky plaque and hardened deposits called tartar from your teeth, both above and below the gum line. The roots of teeth are also carefully cleaned and polished, to clear away all traces of harmful bacteria and remove the source of inflammation. If your gums are sensitive, a numbing gel of local anesthetic may be used during the procedure so you won’t be uncomfortable. If the disease is moderate or severe, periodontal surgery may be recommended. This may be performed with conventional instruments or with lasers. Depending on the area of concern, surgery may be focused on removing diseased tissue from the gums and restoring them with a tissue graft; or, it may be more concerned with rebuilding jaw bone that has been lost near the roots of a tooth. If surgery is needed, your treatment options will be explained fully. Fortunately, most periodontal surgery is relatively minor, and is usually handled as an outpatient procedure with local anesthesia. Even high-tech treatments, such as bone grafting and laser gum recontouring, are now routinely done in the dental office rather than a hospital setting. If you want a healthy smile, it’s always important to maintain good oral hygiene — but if you’ve had gum disease, a daily cleaning routine at home becomes even more essential. Your dental hygienist will show you how to properly care for your teeth and gums by demonstrating brushing and flossing techniques. Don’t hesitate to ask any questions you may have… and remember that practice makes perfect! We can do a lot to help you overcome gum disease — but to keep the problem from returning, you have an important part to play as well.